(CNN) -- CNN's Anderson Cooper spoke Thursday with Treasury Secretary Timothy Geithner at the G-20 economic summit in London, England. 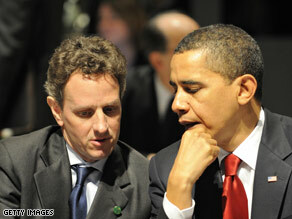 Treasury Secretary Timothy Geithner (left) sits with President Barack Obama Thursday at the G20 summit. Geithner discussed whether the United States bears some responsibility for the global economic woes, the possibility of a global regulator, and how to create a stronger financial system. Cooper: European papers have called this the most important economic summit since World War II. What have you actually accomplished, though? What new concrete steps? Geithner: The most important thing, again, is to get the leaders of the world -- these countries represent 85 percent of global output -- to stand together and say, we're going to act together to do what's necessary to bring this recovery back on track, and we're going to act now to start to lay the foundation for a stronger financial system in the future, a more stable system that does a better job of protecting our economies. Cooper: But there has been a lot of finger-pointing to the U.S. Does the U.S. have anything to apologize for in terms of creating this financial crisis? Geithner: No, I believe the U.S. bears some responsibility for this, but responsibility goes around. I think all countries were sort of overwhelmed by the force of global capital flows. Our challenge now, though, is to make sure we're moving with the rest of the world to pull the world towards higher standards. We want us to see a race to the top, rather than a race to the bottom. We need them to come with us if we're going to be effective in strengthening our system. Cooper: There have been real disagreements, most notably, France and Germany. President Obama, you, yourself, wanted them to spend more, fiscal spending, to stimulate their economies. They were unwilling to do that. Geithner: No, I wouldn't say it that way. You know, these are the way summits work. People come with their own different interests and priorities. But the president came with a strong agenda, very, very broad support for that agenda. You will see very, very strong support for his priorities and his agenda, and the world really was with him on this. Cooper: A lot of people in the U.S. raised their eyebrows when they heard France's president talking about a global regulator who would actually be able to cross borders, reach into the U.S. economy, deal directly with the U.S. financial markets. Geithner: That's not going to happen, and there was really no support around the room for that. Cooper: He said that was nonnegotiable. Geithner: The markets are global, but regulation is still the sovereign responsibility of governments. Cooper: There are a lot of folks wondering -- bottom line -- they're wondering when is this thing going to be over? When is the bottom going to come? Geithner: Well, you know, we have seen some encouraging signs. The pace of deterioration has started to slow. (There's) some improvement, but it took a long time to get here. It's still enormously challenging. Progress is going to be uneven, and we need to make sure we're acting as forcefully and quickly as we can across the board, not just on recovery, but in housing, help get credit flowing again, bring the world with us to make sure there's expanding markets for U.S. exports.